Firefighting and Rescue Negev region commander reconstructs Be'er Sheva fire where baby girl was killed and brother seriously injured. Firefighting and Rescue Negev Region Commander Eli Peretz recounts the difficult moments in treating the fire yesterday in Be'er Sheva, where a baby girl was killed and her brother seriously injured. "After I heard what was happening on the radio, I decided I was going to the scene - and when I got there, I understood this wasn't a routine fire," Peretz told News 2. He added, "I immediately went upstairs, and when I got to the door one of the fire fighters came out with a baby and handed it to me. I went down to the sixth floor, where I met MDA people and passed the baby on to them. I told them they should resuscitate him on the spot because it would take a long time to get downstairs, which they did. Unfortunately, it didn't help." Peretz said that he personally had taken the children out of the house. "I went back to the apartment and it was the same scenario: Firefighters came out and brought me another child, this time I went down to the ground floor so as not to delay with resuscitation. I knew there were many MDA personnel downstairs, and I gave them the boy. I turned to the mother and asked her how many children were at home, and she said she had two more missing. The firefighters began searching, but after 20 minutes her brother arrived and explained that the missing children were with him. "We were in the hospital until 00:30 when I received the message that the baby had died. At the same time we took testimony for the investigation. We set up a special investigation team and until now we're trying to understand what happened," Peretz concluded. 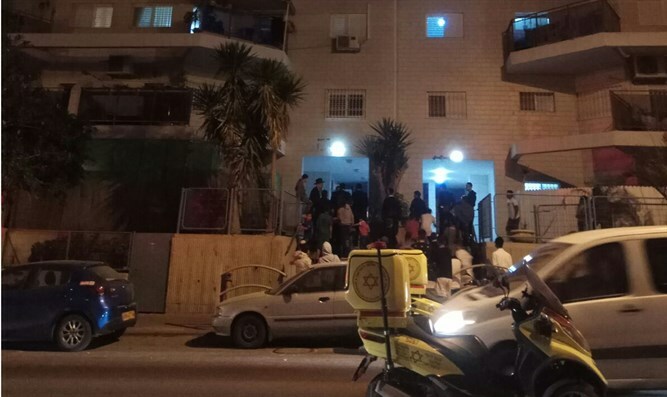 The two-year-old baby, Sarah Shepadov, who was killed in the fire, was laid to rest tonight, and her four-year-old brother, Shneur, continues to be in critical condition and is hospitalized at Assaf Harofeh Hospital.